The opportunity was too good to pass up. On a trip to the Holy Land, our group included a visit to Cana. We were offered the chance to renew our wedding vows at the place where Jesus made marriage a sacrament, an efficacious sign of his presence. My wife and I were only too happy to spend a couple of dollars for a renewal certificate and a few more for several small bottles of Cana wine. The fruit of the ceremony was not what I expected. Before heading to Israel, I researched the customs of Jewish weddings at the time of Christ because I wanted to compare their customs to ours. Back then, a young man would negotiate a price with the father of the bride and then she was called in to give her assent. If she did, agreements were signed and a covenant was formed. The couple was now married but they would go through a period of separation. It took about a year for the groom to finish the room and one look at the geography explains why. 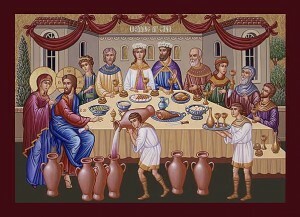 The people of Cana and nearby Nazareth were poor. They lived in caves, in a rocky region good only for growing olives and herding sheep. Homes were dug out of the soft rock of the caves, so adding a room took a lot of effort. The groom would gather his male friends when all was ready, and they would go to fetch the bride at her father’s house. Usually done at night, the men would announce their arrival with a shout to give the bridesmaids time to gather for the procession to the home prepared for the young couple. By the time they arrived, some wedding guests would have assembled. The feast would begin after the couple sealed their union in the marital chamber. The celebrations could go on for eight days, giving the extended family time to get to the event. Jeff Cavins, our tour guide, said that the covenant wasn’t considered complete without the wedding feast. Nazareth is about half a day’s walk from Cana, so it would have taken at least that long for word of the wedding to reach Mary and Jesus and for them to make their journey to the event. But all this background didn’t make sense out of what I felt at Cana. There I needed help from Fulton Sheen and his classic Life of Christ. He said that in Scripture, the announcement of the cross is followed by the joy of the resurrection except in one place – at Cana. There the joy of the nuptials comes first and the cross to which Jesus begins his march at that ceremony is “the condition of that ecstasy” (page 93). 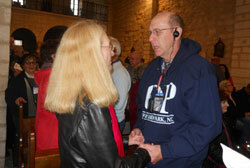 Fletcher Doyle and his wife, Tracy, renewed wedding vows at Cana. This was made clear by the priest who celebrated the Mass and then officiated the ceremony for our group of about 230 pilgrims. He said that the chance for us to renew our vows could be difficult to watch for those among us who are widowed, never married, or divorced. He added that those whose marriage had been damaged by word or deed often turned their gaze from each other at this time. And then he turned his attention to those of us who were really looking forward to renewing our vows. We did this by looking our spouses in the eyes and repeating words spoken by the priest. A widowed friend of ours, who was trying to take our picture, asked us if we knew our noses got red when we got emotional. Then it hit me. When we get married, there is the emotion of the ceremony, the fun of the reception and the joy of the wedding night. But it is inevitably followed by the cross; by opening your heart to love you are making yourself vulnerable to pain. Our Blessed Mother did this when she said “yes” to God and bore the Savior, then at Cana set him on the path to a death that would pierce her heart with a sword. Some in our group had already felt this pain. For the rest, it would be coming. Yet I had a comforting thought. Archaeologists found stone jars at Cana just like the six Jesus filled at the wedding. Archbishop Sheen said Mary seemed more concerned about the humiliation the groom would feel at the lack of wine than did the wine steward and asked her son to rectify the situation. 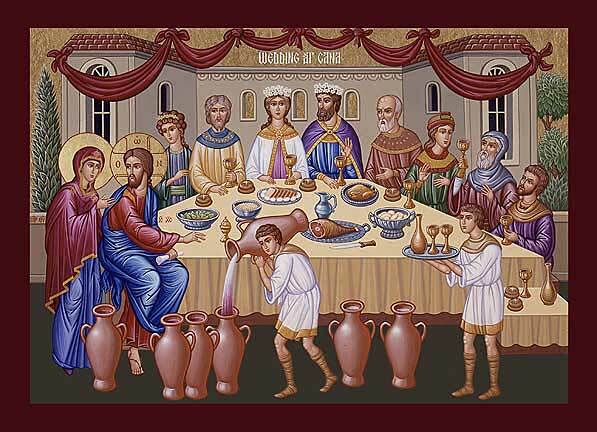 Those jars hold 20-30 gallons, so at his mother’s prodding Jesus provided 120 to 180 gallons, which will keep an open bar flowing for days. Archbishop Sheen went on to add that the wine symbolizes the joy of the event and that Jesus supplies this joy in abundance. So when you invite Jesus and his Mother into your marriage, you can have an abundance of joy. When the inevitable suffering arrives, you can be comforted by remembering that Christ will have a room prepared for you, and he reserves the best wine for last.